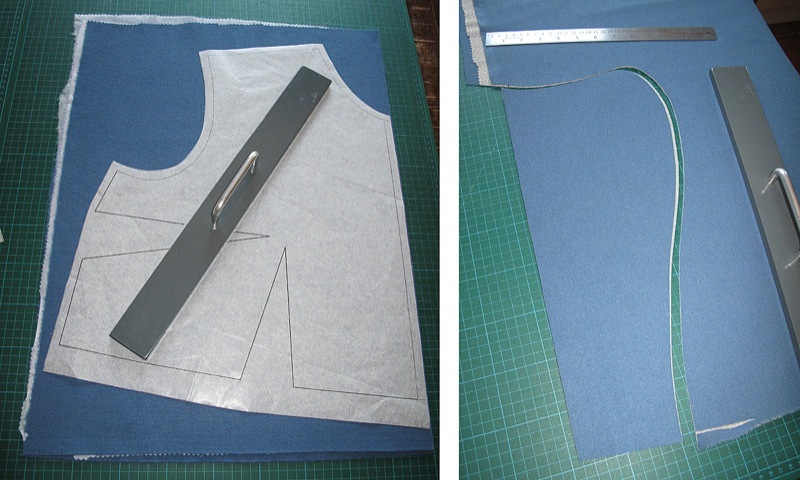 After several months of on-off work I am now finally ready to start cutting some fabric for this cornflower blue version of the Romana Frock Coat. Cutting has been pretty straight forward. The only point worth showing is the front panels which have been aligned with the centre front seam on the grain (see above, left). The lapel is similarly positioned (see above, right). 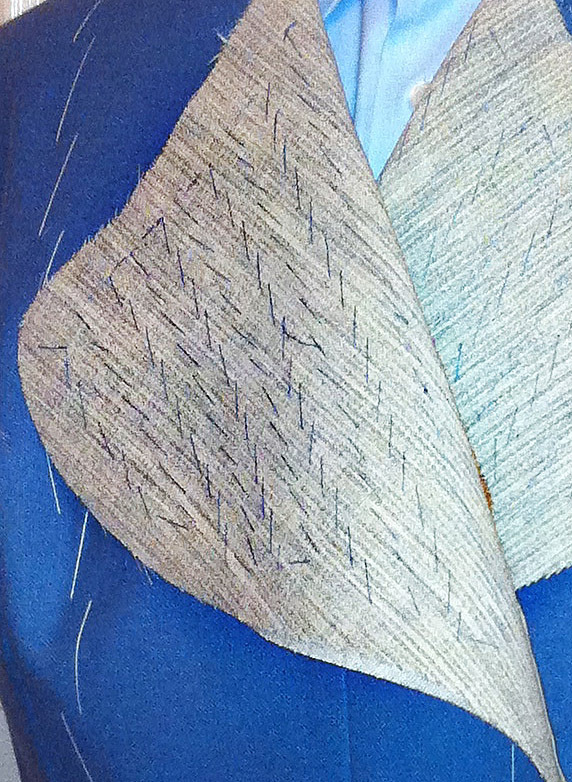 When the bust darts are sewn the side will swing into place. Assembly has been done quickly and simply, with the front panels faced with horsehair interfacing and the large lapels pad stitched all over (see left). It isn’t too long before the body has taken shape and I can put it on a mannequin (see below). 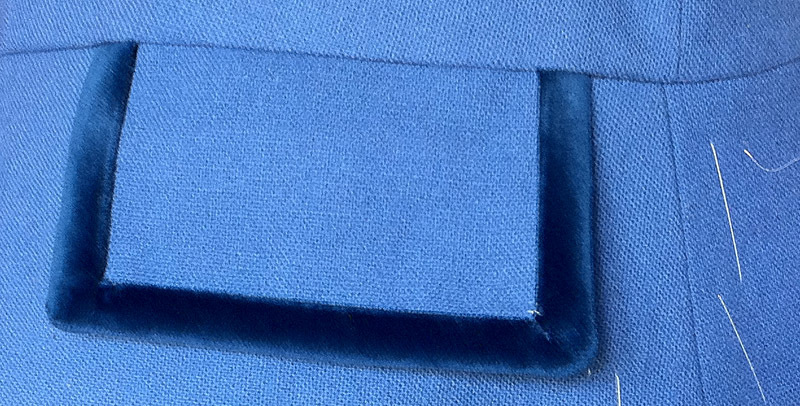 I want to make this coat a little more glamourous than its screen counterpart, so as well as covering the collar with velvet, I’m going to use velvet around the pocket flaps and as lapel piping (see above). The original coat did have something similar, but it was cut from a much cheaper looking man-made velveteen (see left). I’m using cotton velvet which has a much deeper pile and looks a lot nicer. The waistline pockets of the original were faux pockets, but for this coat I have made them functional. To make them useable I need to widen them a little, otherwise it would be difficult to get a hand inside. The larger back pockets are also cut slightly larger too. Once the pockets are set in the skirt I can add that to the coat (see right). The white stitching all over the coat is a running stitch to hold the horsehair interfacing in place while I am assembling. This will all be removed when the coat is finished. 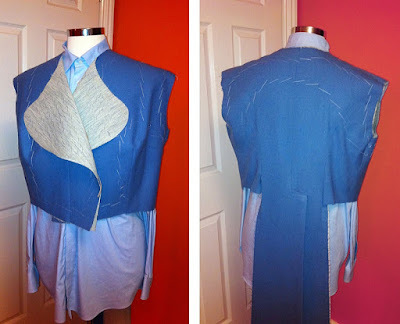 For now I’m gonna pause on the coat, so I can check every things working before cutting the collar, lapels and sleeves.